Tonkotsu ramen (豚骨ラーメン) is a ramen dish that originated in Fukuoka, Fukuoka Prefecture on the Kyushu island of Japan, and it is a specialty dish in both Fukuoka and Kyushu. The soup broth is based on pork bones and other ingredients, which are typically boiled for several hours, and the dish is traditionally topped with sliced pork belly and served with ramen noodles that are hard in the center. In Fukuoka, Japan, tonkotsu ramen is referred to as Hakata ramen. The soup broth for tonkotsu ramen is based upon pork bones, and "tonkotsu" (豚骨 in Japanese) means "pork bones". The soup broth is prepared by boiling pork bones in water for a significant amount of time, up to eight hours, and the broth is typically cloudy in appearance. Additional broth ingredients can include onion, garlic, spring onions, ginger, pork back fat, pig's trotters, oil and chicken carcasses. For service, cooked ramen noodles and slices of roasted or braised pork belly are added, and additional ingredients can include kombu, shōyu, chili bean paste, sesame seeds and others. The traditional preparation method for the ramen noodles used in tonkotsu ramen is for the noodles to be hard in the center. Some ramen shops allow customers to select the level of firmness for the noodles, including futsu for regular or standard, barigane for very hard, barikata for al dente and yawamen for soft. Some restaurants also provide a second order of noodles if requested by the customer, in a system referred to as kaedama. Ichiran is a Japanese restaurant chain that originated and is based in Fukuoka, Japan that specifically specializes upon tonkotsu ramen. Ippudo is a Japanese ramen restaurant chain based in Fukuoka that is well known for its tonkotsu ramen, and has been described as "the most famous tonkotsu ramen shop in the country". Tonkotsu ramen originated in Fukuoka, Fukuoka Prefecture, which is located on the northern shore of Kyushu island in Japan, and it is a specialty dish in Fukuoka and Kyushu. In Fukuoka, the dish is often referred to as Hakata ramen (博多ラーメン) as Hakata is the historical name of central Fukuoka, but can also be called "Tonkotsu Ramen". The dish is prepared in ramen shops in all other regions of Japan. Tonkotsu ramen was originally prepared as an affordable and easily prepared fast food for laborers at fish markets. In contemporary times, tonkotsu ramen is renowned for the significant time it can take to prepare a proper version of the dish. ^ a b c d e Aye, M.M. (2014). Noodle! : 100 Amazing Authentic Recipes. 100 Great Recipes. Bloomsbury Publishing. pp. 48–49. ISBN 978-1-4729-1061-5. Retrieved May 16, 2017. ^ a b c d e f Heiter, C.; Press, T.A. ; George, R. (2009). To Japan with Love: A Travel Guide for the Connoisseur. To Asia with Love. ThingsAsian Press. p. 34. ISBN 978-1-934159-05-7. Retrieved May 16, 2017. 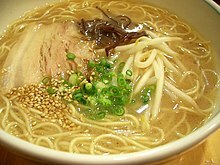 ^ "Tonkotsu ramen's international popularity inspires innovation". The Straits Times. May 8, 2017. Retrieved May 16, 2017. ^ a b c d e f g From the Source – Japan. Lonely Planet. Lonely Planet Publications. 2016. pp. pt384–386. ISBN 978-1-76034-311-8. Retrieved May 16, 2017. ^ Feldmar, Jamie (May 16, 2017). "Japan's and China's Hottest Food Franchises Have Diners Lining Up in NYC". Village Voice. Retrieved May 16, 2017. Japan Ramen Magazine (2017). Tokyo Tonkotsu Ramen: The Best. Nippan Ips. ISBN 978-4-86505-073-8. 200 pages. This page was last edited on 21 April 2019, at 22:03 (UTC).